With Industrial Design by award winning design firm DF-ID, the M10 takes a minimalist theme to new levels of elegance. The slender proportions are enhanced by authentic materials including solid brushed aluminum and smooth glass. Completely operable by Wi-Fi connection to the BluOS App, one need never touch the M10 in order to listen to your favourite songs. As you approach the M10, the high-resolution touch screen beckons as the graphic changes from ‘now playing’ to ‘control panel’ allowing many operations directly from the front panel without opening an app. It also shows what’s currently playing and what is coming up next in the play queue. We have spent considerable effort to make the M10 fully compatible with today’s leading smart home systems from companies such as Apple, Crestron, Control4, Lutron, and many others. 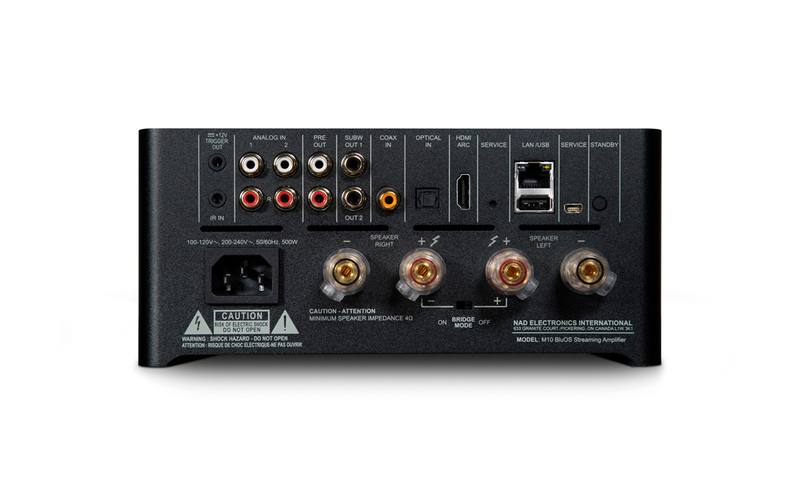 This means that along with your lighting, shades, HVAC, and security, you can seamlessly control your BluOS multi-room music system from a common interface. All of our integrations are certified for reliable operation. We also have custom BluOS apps for iOS and Android mobile devices and tablets, as well as desktop control from Windows and Apple OS. Note: The M10 will include a license for Dirac Live with the option for advanced users to upgrade to a Dirac Live Full Frequency version.